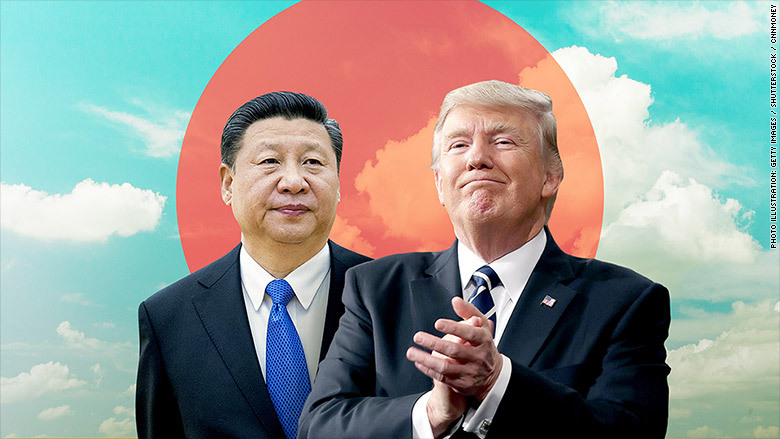 What's Next: The United States is considering emergency measures to limit Chinese investment in American technology, a move that could have drastic ramifications for the tech industry and US-China relations. A senior Treasury Department official said Thursday that the Trump administration may invoke the 1977 International Emergency Economic Powers Act to block Chinese transactions in technologies ranging from microchips to 5G. The IEEPA gives the president broad power to respond to an "unusual and extraordinary threat," and the power to declare a national emergency. But it is usually used against terrorist organizations, or to place sanctions on countries after extraordinary events like the September 11 attacks, not to penalize the world's second largest economy. Meanwhile... Chinese smartphone seller ZTE is striking back at a Commerce Department decision to ban the company from buying US technology. ZTE called the ban "extremely unfair" and said the company "cannot accept it." Good morning. What's Next: Free Time. The world's leading tech companies all offer the same commodity: time. Amazon offers you time not spent in line. Home assistants offer you time not spent looking at your devices. Ride sharing offers you time not spent focused on driving. Just by using these technologies you've built up an incredible store of time (weeks? months?) that you would not have had just a few years ago. Don't squander it by staring at Instagram. How we're spending it: Shucking oysters. US cannabis sales will hit $11.7 billion this year and grow to $25 billion by 2025, according to New Frontier Data, a leading cannabis industry analyst. The growth in recreational and medicinal marijuana use is also set to open a wave of new technologies and venture capital seeking to profit on the normalization of pot use. • MedMen: The Apple Store of Weed: The Los Angeles-based cannabis investment firm manages the process from cultivation to sale, with well-designed dispensaries in California and Nevada that normalize the pot-buying experience. MedMen announced today that its next store will be on Madison Avenue in New York. • Meadow: The Amazon of Weed: The San Francisco-based software service offers an Amazon-like experience for weed buying, including online and mobile ordering, loyalty rewards and analytics that enhance the user experience. • Eaze: The Uber of Weed: The S.F.-based delivery service allows people to order cannabis products directly from local providers who supply drivers. Eaze announced this week that they're expanding to Los Angeles. Recreational marijuana is now legal in nine states, as well as Washington D.C., and poised to become legal in several more over the next few years. Why Wall Street says no: Federal law, which makes investments too risky for large banks and hedge funds. Why John Boehner says yes: The former House speaker, who joined the board of cannabis startup Acreage Holdings earlier this month, says his his thinking on cannabis "has evolved," pointing to help for veterans and reversing the opioid epidemic. • It's based on the California penal code: "The state's 420 code actually applies to obstructing entry on public land." • It's based on police radio code: "Neither LAPD nor NYPD even have a code 420. San Francisco Police have one, but it's for a 'juvenile disturbance.'" • It's based on Bob Dylan's "Rainy Day Women #12 & 35," because "everybody must get stoned" and 12 x 35 = 420. Stop. • "420 started as a secret code among high schoolers in the early 1970s. A group of friends at San Rafael High School in Marin County, California, who called themselves 'the Waldos,' would often meet at 4:20 p.m. to get high." CBD-spiked Cocktails, via Gracias Madre's Maxwell Reis. Apple could be facing a crisis in iPhone sales. The Big Picture, via Bloomberg's Shira Ovide: "Growth in the smartphone market is gone, at least for now. The likeliest buyers now own at least one of the devices. Smartphone owners are holding onto their devices for longer than they used to before buying newer models. In many countries, people have divided into iPhone or Android camps, and there's not much defection." The Latest: Apple shares are down more than 3% after Morgan Stanley said iPhone sales will disappoint. The stock was already down more than 1 percent for the week. • WSJ: "Apple's efforts to line up a second supplier for its high-end smartphone screens—and reduce its dependence on Samsung Electronics Co.—have hit a hurdle because LG is struggling to make them, according to people familiar with the matter." • Mirabaud analyst Neil Campling says that Apple may kill the iPhone X this year. CNBC's Todd Haselton says "it might be true that the phone will be upgraded, but it's not 'dead.'" The final defense witness: AT&T CEO Randall Stephenson made the case Thursday that his company needs Time Warner in order to compete with the "FAANG companies": Facebook, Amazon, Apple, Netflix and Google. • "The FAANG are all focused on premium video ... All of them are vertically integrated." • "The equation is real simple. The more people who watch your content, the more your content is worth." The Big Picture: Both Stephenson and Time Warner CEO Jeff Bewkes, who testified Wednesday, are making the case that media and tech are now in the same business. Here at PACIFIC, we take that premise for granted. What's Next, via Gold: "Rebuttal witnesses from DOJ... We are expecting closing arguments by the end of this month." • During his testimony, Stephenson "shared details about a new streaming service called AT&T Watch, which will be launched soon." • "'Watch' will be a low-cost bundle of channels that is meant to support the cable business model and encourage mobile TV viewing." • "'Watch' will not include any sports channels. This will enable AT&T to sell it for $15 a month, compared to $35 a month for DirecTV Now." • "The Los Gatos, Calif., company has explored the idea of buying movie theaters in Los Angeles and New York that would enable it to screen a growing pipeline of feature films and documentaries, according to people familiar with the situation." • "Netflix executives considered acquiring Los Angeles-based Landmark Theatres, the circuit co-owned by Mark Cuban, but recently backed off the idea." • Earlier this month, Netflix offered more than $300 million to acquire a company that owns billboards across Los Angeles, per Reuters. The Big Picture: Netflix says it will spend $8 billion on original and licensed content this year, but the company is disadvantaged in the awards race because its films don't screen in theaters. Netflix is skipping Cannes this year after the festival banned its films from award consideration because they don't screen in French theaters. The NFL schedules are live. What Next: Grilled oysters, via Bon Appetit.